Squeeze some adhesives onto a surface, and you might also release potentially hazardous chemical substances into the air inside your home. Like many products around the house, solvent-based adhesives typically contain high levels of volatile organic compounds, or VOCs. These compounds play a role in the formation of smog and also pose a risk to health when trapped indoors. For these reasons, a growing number of states regulate VOC amounts. And people across the nation seek green alternatives to VOC-laden products, including adhesives and sealants. Fortunately, many adhesives manufacturers have developed products that either contain no VOCs or meet state limits for VOC content, making it easy for you to find the right green adhesive for most of your home repair and remodeling projects. The products you pick will depend in part on how green you want to go. Environmentally friendly adhesives come in “shades” of green. You might search for a product that contains negligible or no VOCs and is sold in sustainable packaging. Or, you might choose one that is VOC compliant. Since solvent is the source of many VOCs, you aren’t likely to find it in the greener adhesives. Many of the latter are water-, not solvent-based formulas. If you are looking for adhesives in this shade of green, you might want to try Titebond GREENchoice, from Franklin International. The line includes seven water-based construction adhesives, plus a polyurethane-based adhesive and an advanced polymer formulation that are equally eco-friendly. 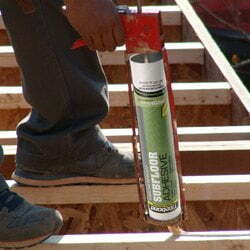 They come in earth-friendly cartridges that are applied with a caulk gun or in recyclable gallon buckets. Some DIYers just plain like the way solvent-based adhesives work. Among other things, they prefer the way these formulations “grab” the material to be bonded (the pros call this good green grab), which makes it easier and quicker to stick things, like wood flooring, in the exact right spot. If you’re in this fan club, you might want to take a look at Titebond PROvantage solvent-based construction adhesives, also from Franklin International. They use a proprietary solvent formulation that relies less on oil derivatives and easily meets the most stringent state and regional regulations. 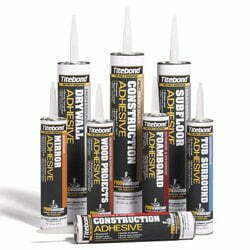 GREENchoice and PROvantage adhesives and sealants are available at True Value and Do-It-Best hardware stores. You also can find GREENchoice products at Ace locations or get PROvantage adhesives at the special order desk at Lowe’s. Google either product line to find additional online and brick-and-mortar outlets. To learn more about more ways you can reduce your carbon footprint, visit the Environmental Protection Agency (EPA) website on green living. After all, everyone shares responsibility for taking care of this shared home: the Earth.